Between 2002 and 2006, the discussion group Discussion about Artwork has actively commented on the competitions for the “Monument dedicated to wars on the territory of former Yugoslavia” by Belgrade City Municipality. The group has also discussed the ideological trajectory of the changes of the title of the monument, in parallel with the changes of the state ideology in the field of public memory, which followed the serial of unsuccessful competition. These changes were actually indicative for the impossibility of the naming of the monument. Each new competition generated the new discussions on key issues connected to the impossibility to name and build such a monument, but also the very discussions generated conflicts among the participants, which resulted in the splits inside the group Discussion about Artwork. The group called Spomenik (Monument) was formed as the result of this splits and differentiations. Through the political differentiations inside the Discussion about Artwork discussion group, where the whole debate started, as well as through conflicts with representatives of the State ideology, the Monument group persisted in the continuation of the public debate related to the issues, generated by competitions for the monument. Grupa Spomenik asks the question: Is it possible to produce a monument that is dedicated to the wars and dissolution of Yugoslavia if its dissolution disputes the very context of the State that proclaims itself to be the keeper of the historical continuity and memory? Is it possible for the State to represent imperial wars, refugees, terrorized civilians and genocide on the citizens of the states that seceded from Yugoslavia without any insight into its own responsibility for these tragic events? 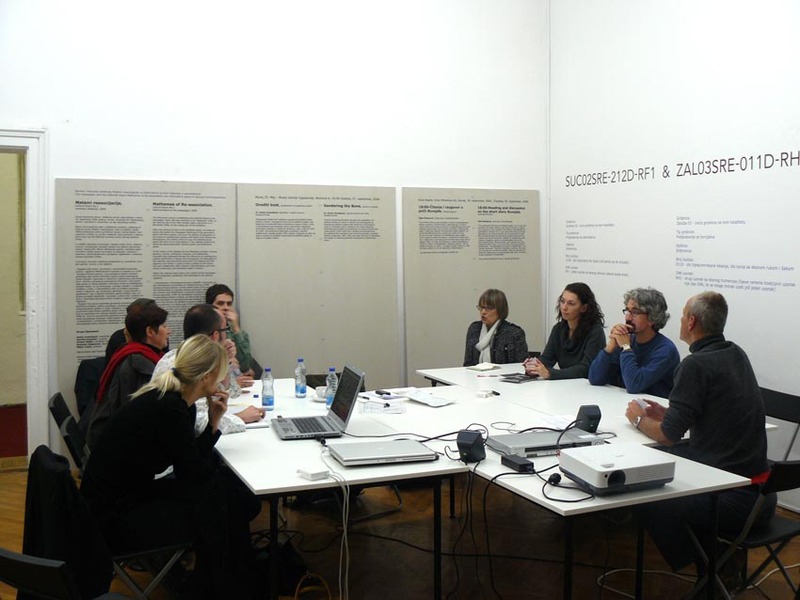 Grupa Spomenik has been active in the broadly conceived fields of art practice and theory, developing strategies and generating a political space to enable a discussion on the Yugoslav wars of the 1990s and the existence of the post-war collectivities in the region. In this space we aim to produce a monument that will neither follow the ossifying politics of monuments, nor the prevailing models of reconciliation. The monument in question is in the process of becoming — it consists of a collective in which each entity defines its own political position. 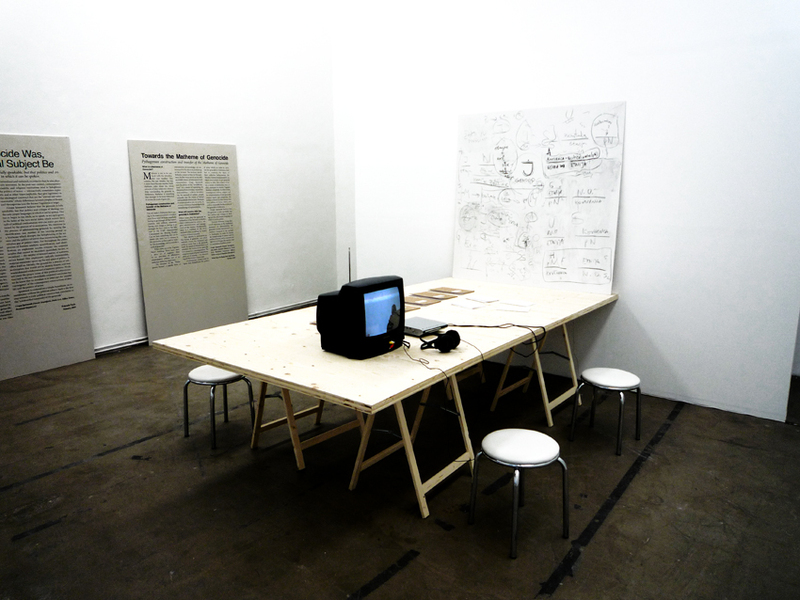 In this way the publication that is a transcript of the (im)possibility of building a monument, becomes a public discussion, stays in the hands of the viewer, and the exhibited installation in the form of the monument disappears. 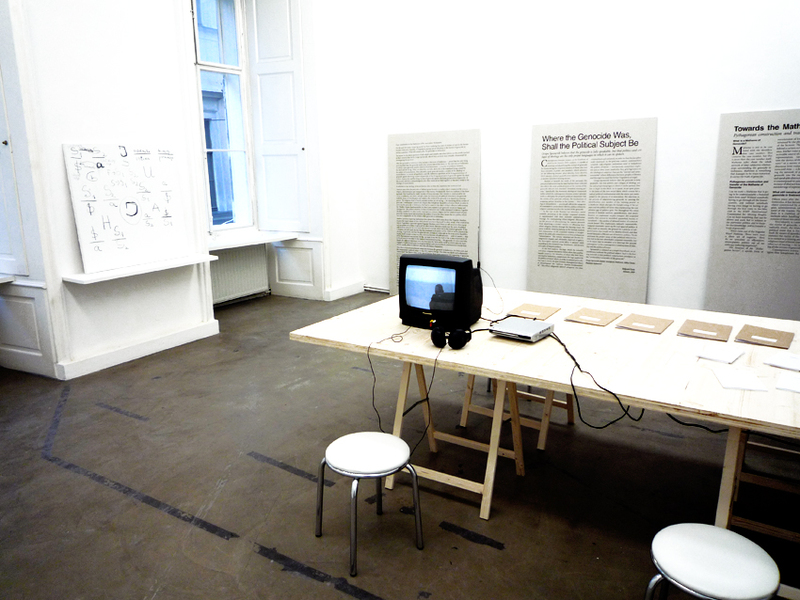 Grupa Spomenik, a New Yugoslav art/theory group believes that the genocide is fully speakable, but that politics and critique of ideology are the only proper languages in which it can be spoken. 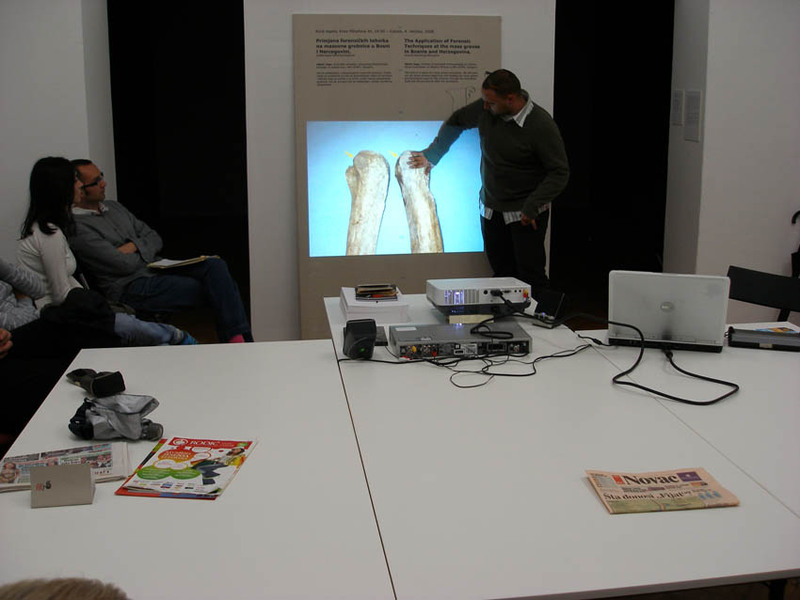 Since 2002, Grupa Spomenik has been active in the broadly conceived fields of art practice and theory, developing strategies and generating a political space to enable a discussion on the Yugoslav wars of the 1990s and the existence of the post-war collectivities in the region. 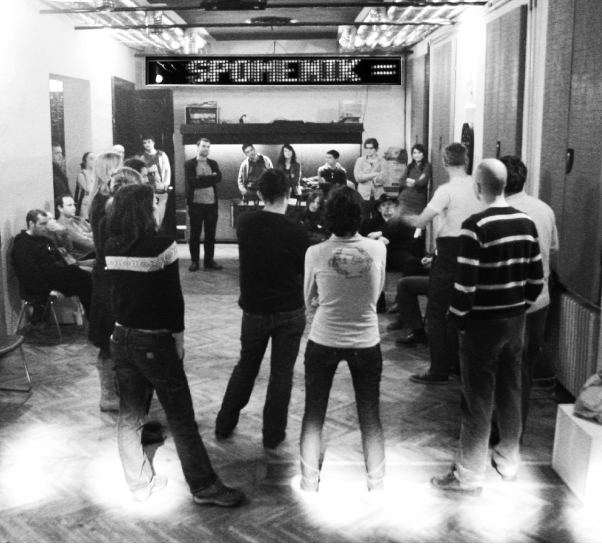 Grupa Spomenik does so by constructing a Matheme of the genocide in Srebrenica, which identifies a political network of inter-subjective relationships in relation to it – as the attempt of the elites who led the wars to put an end to the possibility of people living together once and for all. We remember by produce a Matheme that will neither follow the ossifying politics of monuments, nor the prevailing models of reconciliation, by using different forms of public discussion: installation made out of “Politics of Memory” publications displayed as a “participative object”, as to say “distributive monument”, newspaper and newspaper editorial board; lecture room as performance lecture and discussion site; film and video lectures and discussions; “Pythagorean lecture”, a specific form of transmission of knowledge, were the lecturer stands behind a curtain so that, for the audience, his/her voice serves as the only accessible source of in formation and representation etc. “We aim to establish and practice different modes of belonging and solidarity other then ethno-cultural, which is the imperative posed by both new ethnic states and the European Union”. Lecture Room is one of the sites of the production of the space for a discussion. 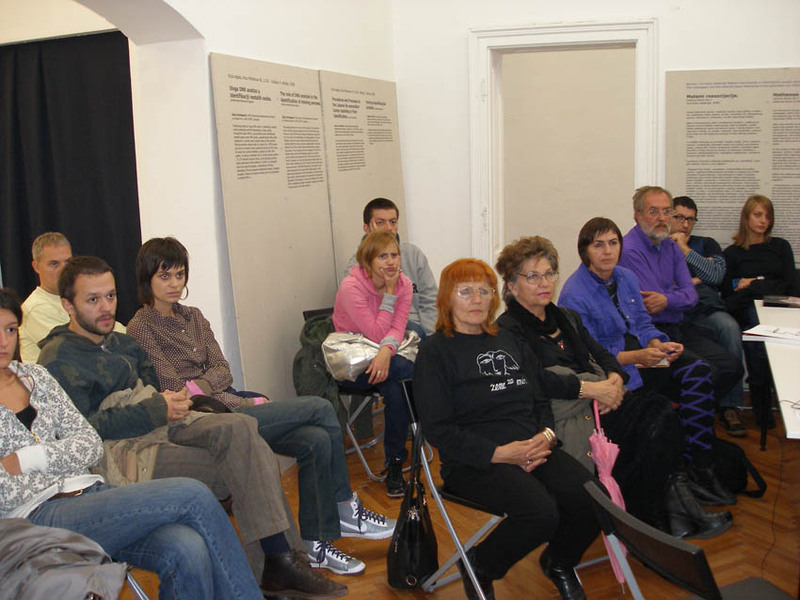 Archive, lectures, discussion table, as well as the place of participation of all who are interpellated to take part in a discussion, to give their own personal suggestion, as well as to articulate the question on the monument that is dedicated to the wars and dissolution of the Yugoslavia, creating a contemporary, living history.